Definition at line 51 of file backward_step_mesh.template.h. Pass overall number of elements in the horizontal and vertical directions, nx and ny, and the corresponding dimensions, lx and ly. nx_cut_out and ny_cut_out elements are cut out from the lower right corner to create the (reversed) backward step geometry. Timestepper defaults to Steady. Definition at line 63 of file backward_step_mesh.template.h. Definition at line 78 of file backward_step_mesh.template.h. Actual build function. Pass overall number of elements in the horizontal and vertical directions, nx and ny, and the corresponding dimensions, lx and ly. nx_cut_out and ny_cut_out elements are cut out from the lower right corner to create the (reversed) backward step geometry. Timestepper defaults to Steady. Definition at line 52 of file backward_step_mesh.template.cc. References e, i, oomph::Node::is_on_boundary(), oomph::FiniteElement::nnode(), oomph::FiniteElement::nnode_1d(), and oomph::FiniteElement::node_pt(). 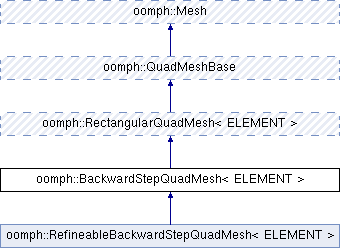 Referenced by oomph::BackwardStepQuadMesh< ELEMENT >::BackwardStepQuadMesh().